New and just remodeled 2 Bedroom 2 Bath ocean view NE (15th floor) in Oceanfront luxury condo/resort build in 2003. Private set up oceanfront beach/pool club, Jacuzzi, tennis court, 24 hour concierge, security and valet services. Direct, same level direct access from the pool to the beach and ocean, nice private resort stile set up, bars, restaurant, convenient store and beauty salon and spa. Pool front cabana stile bar for entertaining the guests with sitting/relaxing area. Apartment tastefully furnished and decorated. Washer and dryer in the unit, Wi-fi internet TV's in every room. King size bed in master bedroom and 2 full/queen size beds in second bedroom. 2 balconies with Ocean view, round tables and chairs. Open kitchen with the granite counter top, glass top stove, oven, dishwasher, microwave, washer/dryer, double door refrigerator, pantry. The suite was very spacious. It was nice that it had a washer and dryer. We only spent one night but I would definitely go again. Great views of ocean and intercostal! Perfect unit for adults or families with older kids due to separate balconies. 2nd bath could use some updating but all in all great stay. This was a girls trip (6 grown women) The location is beautiful. You are right on the beach. That warrants the one star I gave. The hotel (halls lobby) needs renovating. Now the actual condo is AWEFUL. Let me start by saying the furniture: dirt cheap peeled cracked basically crappy and mismatched. Bedrooms: Mattresses super bad and uncomfortable. Again cheap. Dressers in all room peeling and in bad shape. Closet door in master was broken. Living room: There is a mirror accent wall (if you like that sort of thing) it had a huge crack. Bathroom in the 2 bdrm suite was full of big holes on the wall. Holes through out the place as well. Kitchen: this is where it starts get worse. Cabinets are all peeling. Counter top had a huge crack in it. Microwave has some chipping. BUT the kicker here was her so called brand new stove that didn't work. Only 1 out of the 4 burners came on. We purchased $350 worth of groceries and limited stove usage. By this time I said ok I will contact her (I was overlooking all the other flaws) I stated the stove doesn't work. Her response: "its a new stove" I said ok but it doesn't work". Her response again "its a new stove" I replied "its a new stove that DOESNT work. She says there is an extra one in the closet. We go get it and its an old corroded hot plate. I texted no thanks send a repair person. she replied 2 HOURS later saying she will contact me with the appointment time. I stated I was on vacation and I wasn't going to sit to wait for a repair person. Someone in her camp should have a key to the lock that was actually working (2 locks one broken) She never replied that day. Next day at noon she texts that she is still trying to get a repair person. I advised again if I have to wait for them then its no use. So a one burner stove it was for a whole 5 days. I bet you thought that was it! Nope the worse part of this place was THE MILDEW SMELL. So bad 3 of the girls got sinus infections. I was trying to downplay the smell for the girls but even I couldn't take it. Its was DISGUSTING. I have NEVER stayed in a place with issues like this. Its clear the owner wants to do very little to her place but charge a lot. The place needs painting patching working appliances a bathroom make over new mattresses and possibly an interior decorator. I have everything to backup my review from the text messages to pictures of all the flaws. unfortunately I don't have a pic of the awful smell but I can assure you it was there. I received call from this Lady about the stove not working and immediately called to brands mart warranty department to schedule technician to come, unfortunately they could not come and fix the stove right a way. The tech came on 17th and fixed burned switches. I did provide another portable stove burner to them the same day. The holes in the bathroom (the shelf was pulled out from the wall is fixed now, the all walls are painted. The mirror wall in the living room have 5 inch long by the ceiling crack and we cover it , so its not HUGE and its barely noticeable. The Lobby has to be remodeled and apartment should have luxury furniture? Then 2 bedroom in Aqualina resort would be more suitable for those ladies for $2500 per night. Be sure to get the email with directions how to check in. Owners responsive if needed. There are two separate bedrooms. King in one and two full in the other. 2 sofa beds in living room. Kitchen. 2full baths. Washer dryer. Supplies like tp limited. Needed minor repairs where things had been removed from walls. Balcony from every room with gorgeous views. Coffee shop, sandwiches on lowest level, outside bar and food service by pool. Hot tub, exercise room, spa services all great! Right on the ocean! Location just great! Valet service the best ever!! The resort beach was very nice though with all the towers being built around the beach, sunlight can be shaded by the towers in the early afternoon. The room had 3 beds plus 2 futons/pullouts which made for ample sleeping room. 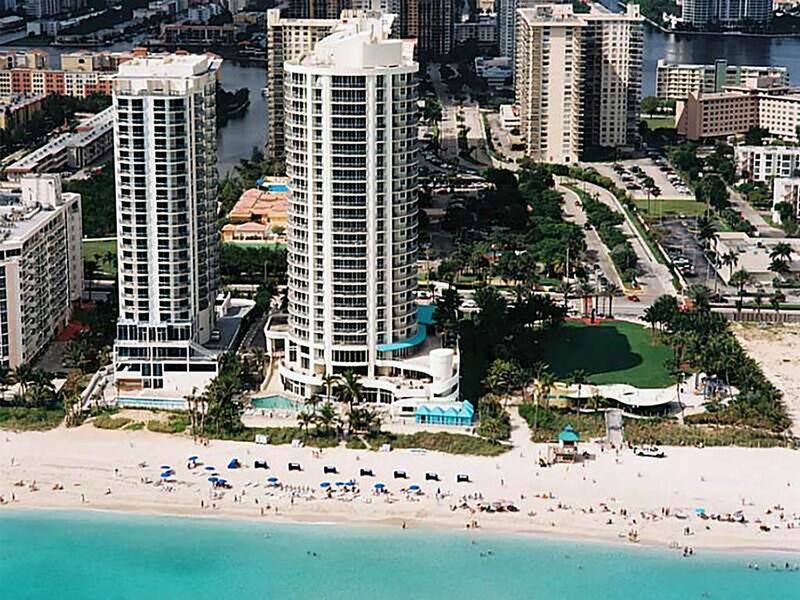 The location was convenient to both South Beach and Fort Lauderdale. The room could use some updating, but what it lacks in new and shiny it makes up for in overall value. Very nice unit,lots of space.Little short of common supplies like hand towels,toilet paper,etc.